It’s that time of the year again as Japanese whisky lovers await the final results of the World Whiskies Awards competition. For the fans that don’t remember, Japanese whisky rocked the competition last year, after expressions were named the World’s Best Blended, World’s Best Single Cask Single Malt, and World’s Best Grain. 2017 was huge for Japanese whisky. After the results of the first of the WWA were released last month, it’s clear Japanese whisky is entering the competition dynamically once more. We’ll be writing up a full report when the final results are announced nearing the end of the month, on Match 22nd, but for now, let’s take a peek at what’s going on in the first round. Yes, of course, as expected, the Hibiki range dominated the aged Blended Japanese whisky category, with the Hibiki 17 and 21 topping the “13-20” and “20 & Over” categories, respectively. However, Nikka didn’t fall far behind. The gorgeous Nikka 12 Year-Old won the “12 & Under” category, while the Super Nikka dominated the “No Age” list, winning over the Hibiki Harmony and other premium NAS blends. But that’s not all. In the Blended Malt category, the Taketsuru range reigned supreme. The Taketsuru 17 won in the “13-20” range, the Taketsuru 21 topped the “20 & Over” and the NAS Taketsuru took control of the “No Age” category. 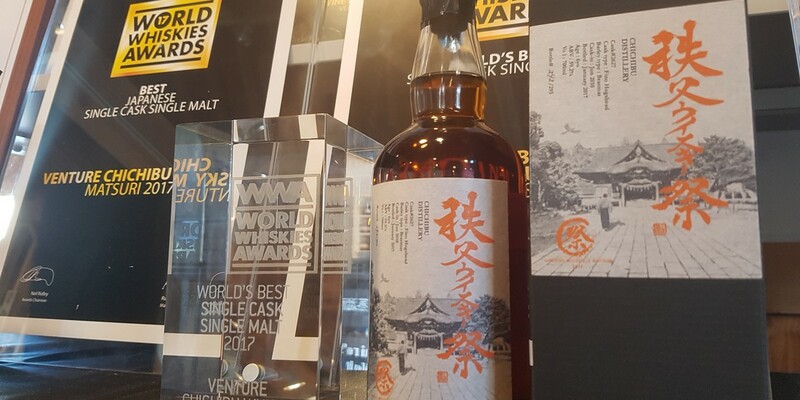 We were overjoyed to see that the underrated, small Wakatsuru Saburomaru distillery shone when their Moon Glow blend won in the “12 & Under” branch of the limited blended Japanese whisky releases. The recent Chichibu Malt & Grain Limited Edition topped the “No Age” list of the same category. Kirin’s Fuji-Gotemba came under the spotlight last year, when it won the award for the World’s Best Grain Whisky. This year, however, the distillery didn’t only win in the “No Age” Japanese grain category, it also topped the country’s Single Cask Single Malt “12 & Under” list, with the Fuji-Gotemba 12 Year-Old Red Wine. The Chichibu Ichiro’s Malt Single Cask #2067 reigned supreme in the Japanese single cask NAS category. After winning the World’s Best Single Cask Single Malt award last year, expectations are high for the small, ever popular distillery. As the industry has expected for years, Hakushu is fully on the rise. The Japanese Single Malt category saw the Hakushu 12, Hakushu 18, and Hakushu 25 dominate all the age ranges of the category, winning over their counterpart, aged Yamazaki single malts. Popping out again, the Fuji-Gotemba Distiller’s Select Single Malt won the NAS section. It’s all very exciting, as this year shows promise from both small and large Japanese whisky distillers. Fuji-Gotemba, in particular, is coming through in many top categories, so the final results will be interesting to say the least. We’ll discuss the results at the end of March. Stay tuned.